According to Feng Shui, the correct choice of clothing and accessories will allow you to attract into your life more positive energy. It will add a lot to your confidence and credibility. Perhaps you still do not know, that the rules of the ancient oriental teachings of Feng Shui can be used not only for the interior design, but also for the principles of selection of clothing. If you want to attract enough positive energy, just take a look at some tips from the Feng Shui experts. First of all, no te the color palette of your clothes. The red color by the principles of Feng Shui symbolizes perseverance, seduction, aggression, so it should not be used in the situations where you do not want to attract attention. White color is bringing joyful emotions and at the same time speaks of the determination. Black - emphasizes the creative and intellectual abilities, so that would be the right color of clothing to wear for a serious examination or an interview. The blue color symbolizes peace and is best suited for recreation, and green - is good for any activities associated with starting - new business or a new phase in your life. At a meeting with your friends or at some family event it is good to put on yellow clothes, because it inspires confidence. Orange color will accentuate your sense of humor, but for the serious meetings, it will not do well. Prints on the clothing are also important. For example, stripes and geometric figures are not the best choice for enhancing positive energy. Strips are "cutting" energy zones of your body and geometric shapes are putting limitations on your energy. More preferable in terms of Feng Shui is a one-color clothing or natural motifs, in particular, small flowers or stems. But the animalistic prints should be worn with care: wild or poisonous animals, as well as prints "a-la" their skins may attract too much of a negative energy. Any sharp or straight lines and details in the clothing and accessories are destroying the harmony of your relationship with the outside world, so you should refuse from the bags of rectangular and triangular cutouts in favor of rounded forms. The same negative opinion experts of Feng Shui also have for the asymmetry, that is so fashionable nowadays. They believe that the asymmetry is distorting the aura and only people with the very powerful energy can resist this distortion. In addition, Feng Shui experts are advising to pay attention to the associations that you have with this or that item of you clothing. If the dress or a purse brings you back to the memories of some unpleasant event, it is better not to wear it too often, and if possible - to give all this things away at all. 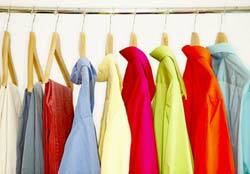 But the items with a good energy must take a prominent place in your closet. Wear them every time when you are going to attend any important event. Even such a trifle as the selection of jewelry, deserves a very special attention in terms of Feng Shui. If your element is Fire, accessories made of fur and leather will bring you a good luck. For the element of Water it is better to wear jewelries made of shells or pearls. Wooden Jewelry will support energy of the people belonging to the element of Wood, Metal - to the element of Metal. You do not need to wear jewelry, that is matching your element, constantly, you can wear them only during the energy decline.